We can all think of such a moment, where an apology was heartfelt, and at the same time we can also bring to mind apologies that did not feel sincere. As I reflect on my own experiences with apologies both given and received, those that have felt most meaningful were the ones where there was reflection on the wrongdoing, there was an offer to work to repair the broken relationship. The response was swift, and responsibility was taken. As we compare government apologies to our own personal experiences, formal state-given “I’m sorry’s” never seem to stand up to the high standards we set for those received personally. As I headed to Ottawa Wednesday morning to sit in the House of Commons and listen as Prime Minister Justin Trudeau apologized for the actions of the Mackenzie King government, who in 1939 turned away a ship of nearly 1000 Jewish refugees who were escaping Nazi Germany, I was thinking about the many times that I have discussed apologies with teachers and students. Would I find meaning in an apology given by a government that was not responsible for Canada’s closed door policy towards Jewish immigration, an apology given nearly 80 years after the MS St. Louis was sent away? Was it too late? Would the cynic in me question the authenticity of the apology and question the motivation? When I listened to our Prime Minister I found myself moved by so much of what he said. I appreciated how he told the history, acknowledging that of all the allied countries, Canada admitted the fewest Jews between 1933 and 1945. He also reflected on the fact that it would take three years after the end of the war before Canada’s restrictive immigration policy would change. I was pleased that he made connections to contemporary antisemitism, including the recent attack on the Tree of Life Synagogue, and I felt proud as the Executive Director of Facing History and Ourselves that he identified the important role of education in combating antisemitism. Even as I witnessed this historic moment and felt moved by all that was said by the Prime Minister and each of our party leaders, I could help but wonder what would change following such an apology? Would there be funds allocated in future budgets to fight antisemitism, might this apology move the government to redouble its efforts to welcome refugees? As I pondered these issues, I looked around at the faces of all those who sat with me in the public gallery in the House of Commons. In a moment, my questions shifted from questioning motivation and follow up actions to thinking about who was receiving the apology. What does it mean for the people to whom Trudeau is truly apologizing, the Holocaust survivors who sat among us? 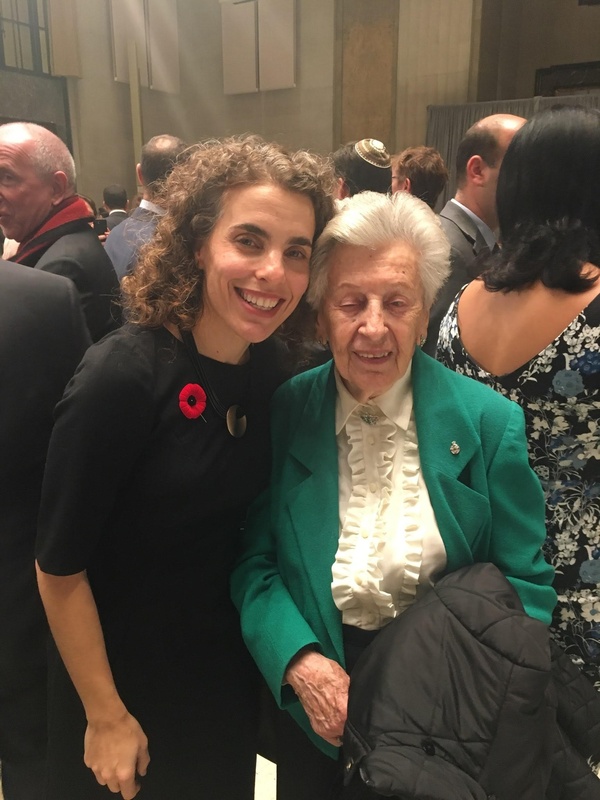 At the reception following the apology I spoke with my dear friend Gerda Frieberg (pictured here with me) who is a survivor of the Holocaust. Members of Gerda’s family were among those on the MS St. Louis. She had made the trip to Ottawa with her granddaughter. I asked Gerda how she felt about the apology. Her face lit up as she shared with me how meaningful it was for her to receive the apology from the Prime Minister. I will certainly remember my experience in Ottawa the next time I discuss apologies with a Facing History and Ourselves group of educators or students, and when the cynic in me will likely once again question the value and meaning of government apologies. In these moments of cynicism I will remember the words of Anna Gordon, who addressed all those gathered at the reception following the apology saying, “This apology is very meaningful to me. I firmly believe that to recognize the matter publicly will lead to better understanding and healing.” I will also think of the smile on Gerda Frieberg’s face when she talked about the importance of the apology that she received nearly 80 years after the Canada turned away the MS St. Louis with members of her family on board. Government apologies do in fact matter. For educators who want to bring the history of the voyage of the St. Louis to your classrooms, click here for a reading and connection questions.